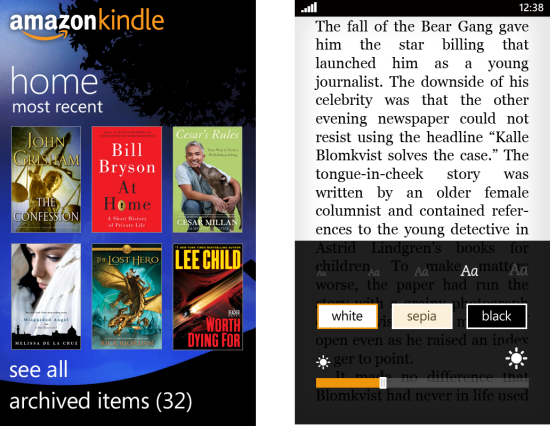 Amazon Kindle app for WP7 is finally available to download from marketplace for free.The app gives the users the ability to read Kindle books on a beautiful, easy-to-use interface. Amazon Whispersync automatically syncs your last page read, bookmarks, notes, and highlights across devices (including Kindle), so you can pick up where you left off on another device. Shop the Kindle Store for over 750,000 Kindle books, including New Releases and New York Times Best Sellers. Choose from thousands of free classics, such as Pride and Prejudice or The Adventures of Sherlock Holmes. Get free book samples, read the first chapter free before you decide to buy. Customize your reading experience by choosing the background color, font size, and either portrait or landscape format. To download the amazon kindle app for WP7, just search for it on marketplace or download via zune HERE.